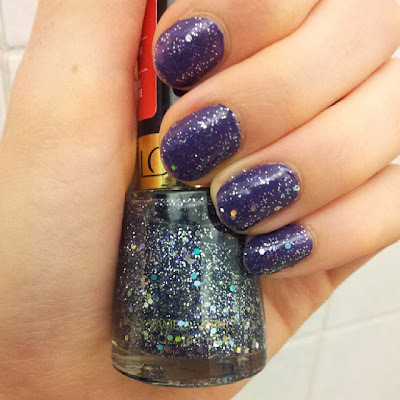 I begun the month by applying two coats of 'Star' to cover up the mess that was Revlon 'Rock'. I see what they did there, releasing these two together. I don't think the combo really worked - 'Star' is made up of silver and dark purple glitter and the dark purple is difficult to see over 'Rock'. I decided to try it over white or lilac next time. This is a beautiful black blue with very fine bright blue glitter. Unfortunately it took three coats to look good, so next time I'll try using a black polish for the first coat, to try to make the bottle last longer and stop tipwear from occuring so quickly. When the chipping got really bad I covered it up with this. I was surprised by how much I like it though it looks really 80s (bar glitter always does to me). 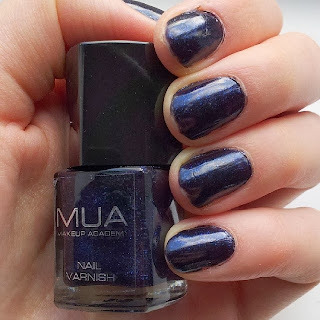 It is pretty easy to apply, though sometimes an extra coat is needed to get an even amount over glitter over the nail. It also needs plenty of time to dry to avoid the smudging you see here! 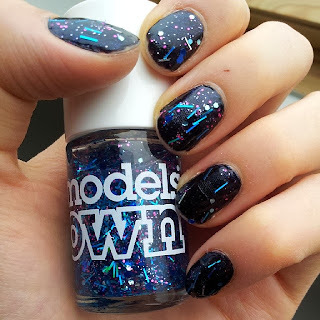 I bought a whole load of Models Own nail polishes to try when they had an offer on, so expect to see a lot more of them in Nails of the Month posts! I'm not great at drawing so I won't be trying any complicated nail art, but I'm looking forward to wearing a lot more glitter in December! Will you be attempting any festive nail designs? I love that polish, will definitely be trying it over lighter colours as well.